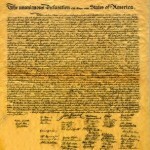 The Declaration of Independence ends with the line, “with a firm reliance on the protection of divine Providence, we mutually pledge to each other our Lives, our Fortunes and our sacred Honor.“ That well known phrase sums up the prevailing philosophy of the lives and times of the Founding Fathers. As rich in meaning as we find the entire document, perhaps we can learn the most from these twenty four words. The phrase begins by declaring their “firm reliance on the protection of divine Providence”. We have a shorter, more concise way of expressing this… trusting God. With the plethora of problems facing our country and world today, depending on divine Providence is the only path to our brighter future. This does not mean that we sit back and twiddle our thumbs any more than our forefathers did. They put feet to their prayers for peace and freedom… with the assurance that by aligning themselves with their Creator, they would insure the success of their venture. This is followed by “we mutually pledge to each other”. In an age run by the “me generation” and selfish ambition, working together for reciprocal interests is as powerful as it is rare. Consider that twelve men changed the world. While the first American Revolution was followed by divergent views of the Federalists and the anti-Federalists, but until victory was won, they followed Poor Richard’s advice, “We must all hang together, or assuredly we shall all hang separately.” This doesn’t mean we all roll over and give up our concepts of what makes a free society. It does not mean that we don’t support our preferred standard bearer with every thing we have. It does mean that we stick to differences in policies and execution while we avoid personality based attacks. It means that we really don’t need to trash fellow freedom fighters as many are prone to do with people like Sarah Palin. I can accept the fact that she is not everyone’s darling, but the attacks coming from those who say they support smaller government and greater individual freedom are way beyond appropriate. We need to take a tip from our previously successful opposition who rarely trash each others publicly. Behind closed doors, they may pull the rug out from each other and stab each other in the back, but then come out smiling and laughing like old friends. We have enough working against us, including a progressive press that won’t give is half a break, we do not need to air our dirty laundry before them and give them more potential to make us look bad. They pledged their “lives”. Their lives… their physical being on earth… were something they valued less than the fruits of the victory they fought for. It was not just the possibility of ending their lives at the end of a British rope, but they gave up their comfortable homes and family lives to take on the most powerful monarch and army in the world. For the most part, they did not have to do this to insure their prosperity, they did it for the precious goal of freedom. This was more important than the quiet life they could have lived without the conflict they began – and finished. They pledged their lives, and some how, many of us have trouble pledging a couple of hours to do whatever is needed to beat back the progressive assaults on liberty. They pledged their “fortunes”. Because many of the founders had the wealth to make themselves comfortable, they also had the wherewithal to finance the men in the field. Unlike many of the present day beltway benefactors, they wrote the checks out of their own accounts and not out of money confiscated from others. They understood the meaning of putting their money where their mouth is. They believed in what they were about and put everything they had into it. I once had a pastor who would tell us you can see what a person really believes by looking in his check book. Matthew 6:21 puts it this way, “For where your treasure is, there your heart will be also.” (NIV) These men and women dedicated their resources to their passion for liberty, and so many today don’t bother to write even a small check from time to time to further the cause. Then, the last thing they pledged was their “sacred honor”. This is, perhaps, the most important of their possessions. It is what gives the other things meaning and value. It is at the core of the difference between much of the tea party movement and their progressive opposition. To many progressives, there is nothing sacred, except, perhaps, a woman’s “right” to kill her unborn child. To those of us who claim a Judeo-Christian basis for our lives, every person is sacred because of who created them in their mother’s womb. Also, the “unalienable rights” are sacred because they come from our Creator and not from any group of men who decide which freedoms we should enjoy and which we should not. Just as it is an abomination to destroy the gift of life our Creator has placed in a mother’s womb, it is also an abomination to allow the liberty He has given us to slip away, stolen by those who would seek to control our lives and misappropriate the resources He has also given us. Then we have the concept of “honor”. Glenn Beck helped us understand the idea with his Washington, DC rally. To many, a sense of honor is as foreign as the Swahili language, and about as irrelevant. They call themselves pragmatist. They are only interested in getting the job done. This ultimately leads to the end justifies the means philosophy so prevalent in today’s culture. This means that, to many who have clawed their way into the DC power elite, that whatever they have to do to accomplish, what they believe, is good for the country or themselves, is justified. This means lying to the public and ignoring its expressed wishes is entirely acceptable if is for a worthy cause. It means that trampling on rights the American people hold sacred is permissible if it helps the elites remake the culture in their image. It means that those to follow this path are worthy of no place in our decision making process and that our time, our effort and, yes, our treasure is rightly spent in defeating them and their schemes. They cannot be permitted to succeed. If we don’t set aside some of the non-essentials in our lives and and concentrate on the essentials to do everything, including using our time and whatever level of fortune we have been blessed with to remain free, we are just not worthy of the Founding Fathers and the sacrifices they made to make the United States of America a great nation and leader of the world.